We’d love your help. Let us know what’s wrong with this preview of Change Your Life in Seven Days by Paul McKenna. To ask other readers questions about Change Your Life in Seven Days, please sign up. I just finished it and took the time to copy a lot of the exercises and different ideas out into another book so that they would solidify in my mind. I think that if you have the time to really concentrate on the exercises and incorporate them into your daily life then it will certainly change your life. Mine is definitely different from 7 days ago. I have a very different outlook on myself and my place in the world. I didn't think of myself as worthless before this, but I certainly feel like I I just finished it and took the time to copy a lot of the exercises and different ideas out into another book so that they would solidify in my mind. I think that if you have the time to really concentrate on the exercises and incorporate them into your daily life then it will certainly change your life. Mine is definitely different from 7 days ago. I have a very different outlook on myself and my place in the world. I didn't think of myself as worthless before this, but I certainly feel like I have more self worth now. I also really enjoyed the Immunity booster exercise. No I'm not a millionaire with an entourage taking care of my every whim, (that will probably take a couple of months), but I know that the future will definitely be better for me. اللي كلها كلام تحفيزي و مفيهاش اي "أداة"
I got this book out of the library and really enjoyed it, even though these books are usually laughable fluff you can't help but glance through. But, yes, I think it really did change my life. I have several of the catch phrases mentioned in the book - such as: there is no such thing as failure only feedback - on my vision board! When in certain situations they pop into my head. Also, a few of the visualisation exercise I found really helpful. There is one to combat worrying, and I have used it I got this book out of the library and really enjoyed it, even though these books are usually laughable fluff you can't help but glance through. Also, a few of the visualisation exercise I found really helpful. There is one to combat worrying, and I have used it over and over again. 2018’in ilk kitabını bitirmiş bulunmaktayım. Oldukça başarılı buldum. Hakkında yazı gelecek. Do not take me wrong, I am usually rather skeptical about this sort of book and most authors who write this type of literature do not strike me with the sound honesty of Paul McKenna. His book is REALLY helpfull if you are trying to renew your life and energy and get into better routines and a more productive phase of your life. This is brilliantly prepared to couch you into finding out your better, brither SELF and criatively developing your best route to HAPPINESS and FULFILLEMENT. I loved t, yo Do not take me wrong, I am usually rather skeptical about this sort of book and most authors who write this type of literature do not strike me with the sound honesty of Paul McKenna. His book is REALLY helpfull if you are trying to renew your life and energy and get into better routines and a more productive phase of your life. I loved t, you will, too. The tips and advice in this book are great! This book will definitely help but you need to have a positive attitude and the belief in yourself as well as in what McKenna writes. I keep this book on my "active" bookshelf at home. It is one of a few I turn to whenever I start heading to my negative side. It's a must have for anyone that suffers from depression and/or anxiety. Totally amazing! Changed my life! At first, this sounds like an interesting and educative book. But when I got further in the book, it felt rather irritating. So many obvious things stated here, not an enjoyable read. I give it two stars because of the quotes and sometimes good life lessons. Great book, it did inspire me back when I read it as I was looking for a job and was unemployed so was very helpful in that respect. I need to read it again though. 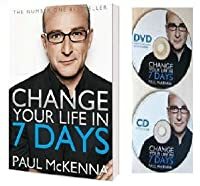 THE new book by Paul McKenna, CHANGE YOUR LIFE IN 7 DAYS, is in my opinion, one of the best self development books this year. The book is very easy read, and it comes with the meditation CD, and DVD, on the program where the author himself demonstrate and facilitate the reader to practice the techniques from the book to reprogram your mind to work for you. The book reminded me of Tony Robbins' UNLIMITED POWER, which I highly highly recommend anyone who wants to live a more fulfilled and powerful life. But McKenna simplified some of the scientific side of the mind power, and went straight to the points where he wants the readers to work on their minds immediately after reading the short chapter (thus, 7 days stood true). 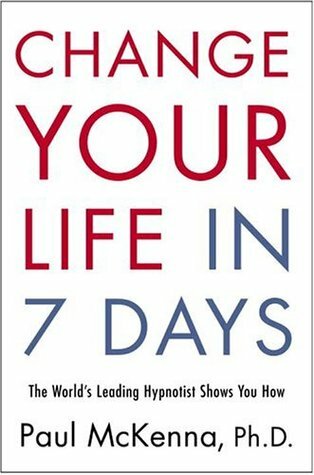 This book can really change your life in a short 7 days, especially if you don't usually read this kind of books and take the exercise within seriously and work on your mind daily. of course the author can tell you all you need to know, but if you do nothing about it, nothing will be changed. So, it is totally up to the reader how bad they want to change for the better life. The book has done a great job as far as the "how to"s is regarded. I have just finished the book and did the exercise as I read it, now I want to go back to the exercises (in my notes) and practice them daily. Your life might not have any big changes right after you did your first set of excercise, but it does change your perspective on all things in your life, and thus help you to get into the habit of living the moments fully. Which I think is vital to live a fulfilled life to anyone, you have to be able to appreciate now, wherever you are whatever you are going through, in order to live a happy life no matter what the circumstance. Overall, the book did what it claimed to do and the author, once again, shared what he knows on improving people's lives. If you are interested to find more on the self development material and to really truly want to change your life for the better, while make 100% commissions. (no kidding or fluffing) you can find out by clicking the links below and /or watch the FR.EE Vid on this site. Successful people make plans, not the beautifully highlighted in pink and yellow with coloured shapes drawn over the top but one you create from within yourself. I did mine in a motorway services carpark where I had stopped for a rest. The CD is an important part yet I can't get mine to skip to the sections. It always starts at the beginning and I am totally relaxed after three minutes. Maybe I will leave it playing just so I can hear what is at the end! Very good set of mind tools. Ngày 1: Bạn thực sự là ai? Tiềm thức của bạn được hình thành như thế nào? Trạng thái cảm xúc là gì? Cảm giác xuất phát từ đâu? Nếu tôi không biết điều gì để mơ? Bước 2 – Quẫn trí! Nguyên nhân số một của bệnh tật là gì? Vì vậy tôi nên tránh sự căng thẳng không? Nhưng điều gì xảy ra nếu tôi thực sự ốm? Không được hạnh phúc khi nào? Nó có thể trở nên tốt như thế nào? 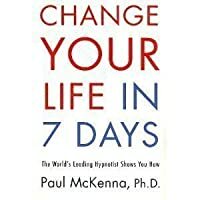 The title caught my attention because how could you change your life in 7 days, there's no such thing as a quick fix however this book has seen a marked change in my attitude and behaviour. It reinforces lessons I've already learnt and taught me some really important lessons. This is an easy to read book with lots of valuable information and if you have the wherewithal to implement the lessons, you can change your life and you will start to notice the difference quickly. I will definitely be goi The title caught my attention because how could you change your life in 7 days, there's no such thing as a quick fix however this book has seen a marked change in my attitude and behaviour. It reinforces lessons I've already learnt and taught me some really important lessons. Uma leitura agradável. Um bom livro para quem quer começar a traçar mudanças na sua vida. O autor foca muito o seu método o que pode levar-nos a fixar muito nele, pelo que é preciso ter sentido critico e alguma capacidade de aplicação e ajuste à realidade de cada um. Um livro realmente interessante e motivador que nos traz algumas estratégias bem engraçadas que nos ajudam a fazer aquelas pequenas mudanças no dia-a-dia. A great practical motivating book. Taking notes on the exercises and quotes from the book and applying them to my life made a huge difference in the way I look to people and things. I recommend this book to everyone out there. بتعرف وبتستوعب نفسك وأفكارك . لغة الكتاب مو صعبة بس طبعاً احتجت استخدم ترجمة قوقل لترجمة بعض المفردات . Positive feedback, self affirmation, and guided imagery. Put them together, they're a powerful combination. If you do the exercises, they can make a difference. The title's a little over-hype, but, hey, you have to sell books, right? great book for transforming your perception about yourself. Difficult to say much about this one. This book really helped me boost my confidence! Synthesizes a lot of other top self help books and adds a hypnosis cd. An entertaining lecture, which helps you to increase your daily confidence, in the same time remaining authentic. I have not heard the CD yet, I guess it will have a greater impact on me. I don’t know why I just couldn’t get into this book, especially after how helpful I found I Can Make You Confident. Left off p.124. You take out 2 sheets of paper. On one you write who you are today; and on another what you want to be. Each day you take steps toward that achievement. "My children are so BACKWARDS." "Peter is good with math; you are GREAT WITH MUSIC." "There will be NO CARD PLAYING in this home." "There will be NO DIRTY DANCING." "You are a DIRTY BLONDE". (r You take out 2 sheets of paper. On one you write who you are today; and on another what you want to be. Each day you take steps toward that achievement. "I want a CLAIMS EXAMINER or an ACCOUNTING CLERK position; and a FLUTE." "In privacy, I would like to learn BELLY DANCING." "My hair is CLEAN; and I choose to VALUE MORALITY."